Number Eight brings with it an extremely loyal, persevering and tenacious energy. Those born under this number are here to gain mastery of the self. They are cool and analytic, and can be considered the masters of shrewdness. They have great determination and would do well to use meditation to develop a polished, focused mind, as they have capacity for great concentration. 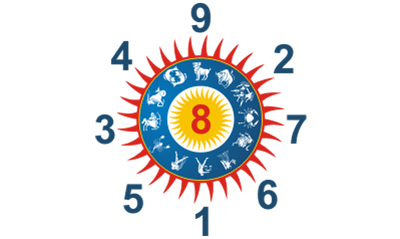 Those with Number Eight have a strong drive to achieve, and they are bound to succeed in organizations and business. Number Eight creates a flair for material success. They have great sympathy for the oppressed; as any struggles they have endured make them compassionate towards other's pain. Number Eight brings forth a natural interest in justice and law. Those with Number Eight do well in many forms of corporate business including banking and accounting. They have some visionary abilities and are powerful when being authentic. They should guard against extreme views if they become interested in religion and develop tolerance toward others, who may not share their beliefs. These people are naturally patient and persevering. They are willing to make sacrifices to achieve their goals, but this should not let them become arrogant towards others who are not as strong-minded. They should never underestimate the strength of their will-power and should apply it for noble purposes. Their endurance can help make the world a better place and they are capable of making a real difference in the lives of others.